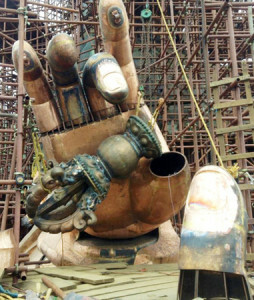 The construction work of this giant Guru Statue project started in February 2008. The predicted completion date is before April 2015 (excluding the Backlight and Umbrella), and the grand opening ceremony will be held in May subsequently. 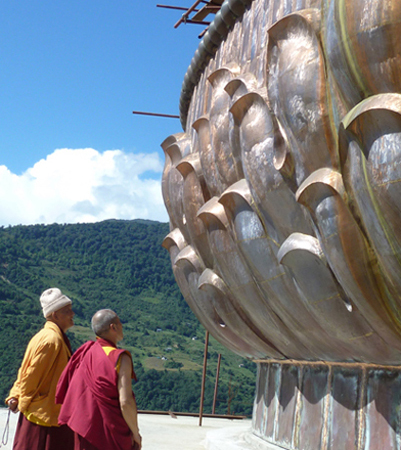 Druk Odiyana Foundation is indeed grateful for all the devotees involved in this peace project for the time being. 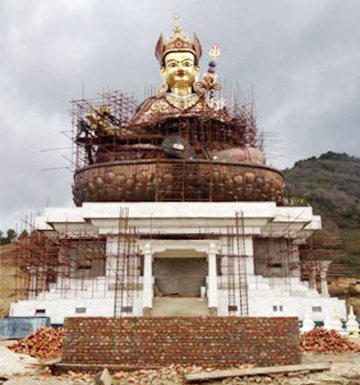 Because of your great supports, the majestic Guru Statue’s exterior including the painting of gold, the Lion Throne and the Lotus base etc., interior including three storey monastery of main shrine, subsidiary shrines, statues, museums, carvings and Buddhist art work etc., are gradually reaching completion. Nevertheless, the following work is going to be even more arduous since a backlight of 190 feet in height and 118 feet in width with an umbrella at the top of Guru Statue is going to be built. (If a storey counts for 10 feet, the total height of this huge backlight is equivalent to a 19 storey building.) 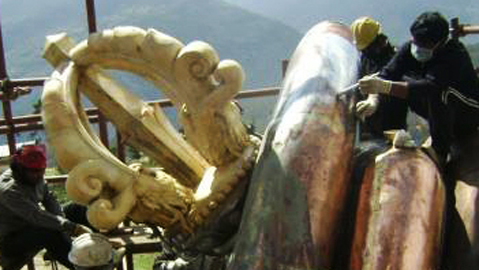 All the elements and ornaments will be men-made by Nepalese carving artists. Please continue to support us to complete the latter construction work. A team of professionals are engaged in the designing and constructional work throughout field studies and meticulous meetings and hoping to complete the final part of the project as early as possible. The entire project is conceptually designed by the Ven. Khenpo Karpo Rinpoche. 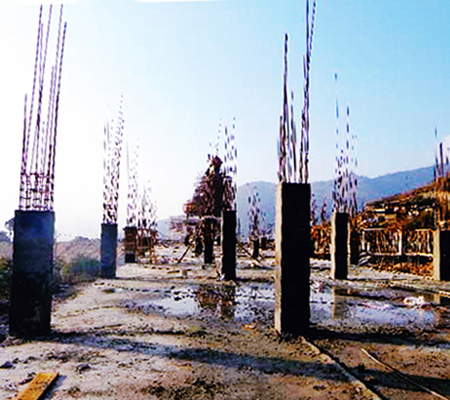 The construction process has been particularly straitened due to geographical restriction, transportation difficulty and environmental constraint, each part of the project has been carried out traditionally by hands instead of machines. The progression has been tremendously backbreaking. 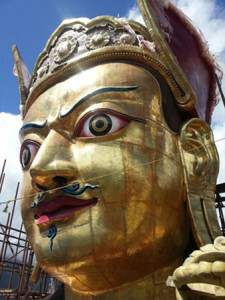 A landmark construction of a statue of Guru Padmasambhava in the form of Guru Nangsi Zilnoen, seated on the Lion Throne (Sengthri) exposed to the elements in its symbolic radiant perfection, in the posture of victorious subjugator of all illusory appearances symbolizing subjugation of all negative forces. The statue is 173 feet in height including a 40-feet-tall Lion Throne and a 19-feet-high Lotus seat (Pema). The exterior edifice will be built in bronze as the basic structural material with all the intricate individual laminates exquisitely and laboriously hand shaped and fixed into place. The face measures 14 feet in length made with bronze coating in precious 9999 stamped pure gold. The spacious circumambient path of the giant Guru Statue allows circumambulating. The interior houses a three storey monastery (Lhakhang), each level from top to the first floor represents ‘Dharmagaya’, ‘Sambhogakaya’ and ‘Nirmanakaya’ of the Buddha respectively. There are statues, wall frescoes and a myriad of icons describing the history, culture, literature, life, and fine arts involving predominantly the teachings and practices of Buddhism. This represents the righteousness and the sanctity of paradise, as well as a means for people to develop a generous, peaceful, and pure heart so that they can accumulate merit, which is believed to be the source of a happy future. The Lion Throne measures an area of about 9500 square feet and houses the first floor main monastery, Gangza Nyenjur Lhakhang, which can accommodate 650-700 people for religious gatherings and blessings. This main monastery of Nirmanakaya Buddha featuring seven exquisite major Buddha statues, with the famous Guru Ngadrama (Looks Like Me) in the middle. 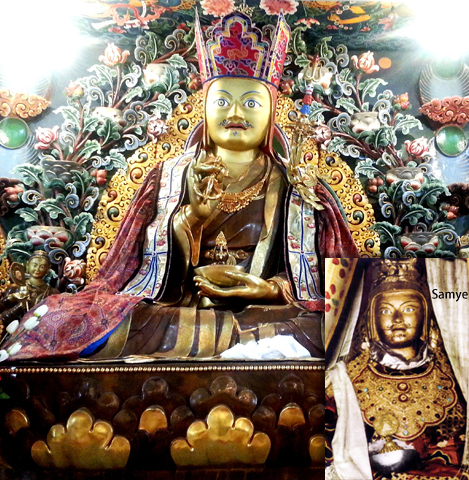 The Guru Ngadrama was built by Guru Padmasambhava himself at the Samye Monastery in Tibet. Unfortunately, the statue was destroyed with merely a single picture preserved. Based on this remaining picture, the Ven. 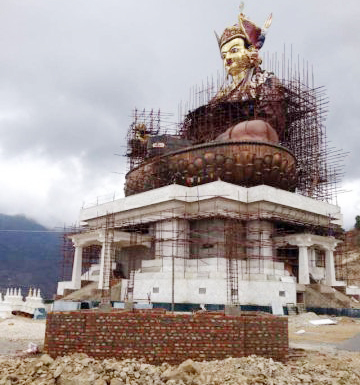 Khenpo Karpo Rinpoche built this so far the only duplicate of the famous Guru Ngadrama Statue. On the right hand side of the Guru Ngadrama are the “Khenchen Bodhisattva“ known as Shantarakshita who was a renowned 8th century indian great abbot, “Longchen Rapchampa” who was an emanation of Guru Rinpoche, and the great terton “Dudjom Rinpoche” who is the root master of Khenpo Karpo Rinpoche as well as an emanation of Guru Rinpoche. On the left hand side of the Guru Ngadrama are the Tibetan King “Trisong Deutsen” who invited Guru Rinpoche to Tibet, the “Rigdzin Jigme Lingpa” who was also an emanation of Guru Rinpoche, and the “Khenpo Ngakchung“ who is also the root master of Khenpo Karpo Rinpoche. The Lotus seat houses a smaller monastery in the second floor named the Rigzin Dagyud Lhakhang, which is the monastery of Sambhogakaya Buddha featuring Vajrasattva and a mandala of hundreds peaceful and wrathful deities, with an area of about 3500 square feet accessible to the terrace. The terrace will serve as a circum-ambulation path (Nang Kor) for devotees and visitors, with a railing on the outer side. An internal spiral staircase from within the Lotus Seat will lead upwards to the subsequent sanctum above named the Gyalwa Gonju Lhakhang which is the monastery of Dharmagaya featuring the Five Dhyani Buddhas. The body of the Guru up to the top will have a series of slabs dividing the giant statue into a series of ascending sanctums which are places of worship or filled with precious Zung, including the relics, sutras, jewels and all kinds of the most precious substances in the world, as well as the hundred thousand four-inch-tall Guru Dewa statues. The Guru Pamasambhava represents Buddhas of the three times, the past, the present and the future. This giant Guru Statue will be surrounded by eight big Stupas/Chortens (Dezhen Gyed) of 43 feet in height marking the four corners of the site and four cardinal directions. Each of the big Stupas’ interior prayer wheel contains billions of mantra of Vajrakilaya, Amitabha, Amitayus, Padmasambhava, Avalokitesvara, Vajrasattva, Dorje Drolod and Sid Dok (the mantra for the prevention of the negative forces) respectively. In addition to the big eight Stupas, there will be small Stupas built in between forming a circumambience of 108 Stupas in total. With all these in place the entire complex would symbolically represent the Mandalla/Kilkhor (the outer Cosmos) with the Guru in the centre. 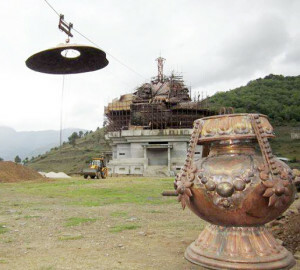 The construction of the Stupas evokes the memory of the Buddha and the Dharma activities of Buddha Shakyamuni. It also represents the complete path to enlightenment which results in the enlightened mind of Buddha, the Dharmakaya. The Buddha’s eternal presence is contained in the Stupa. 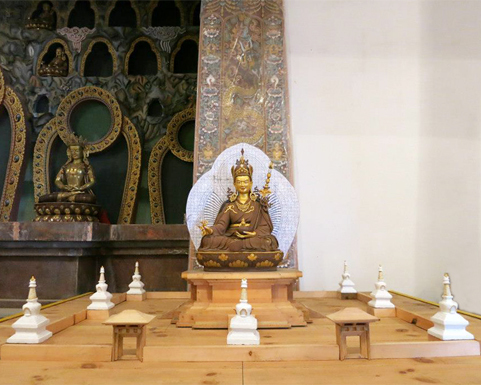 It is also stated in Ratnakuta Sutra, “The merit generated in paying respect and homage to the stupa is same as worshipping the Buddha himself. The reason for that is because Buddha is the manifestation of the Dharmakaya but Rupakaya.” Therefore, the Stupa is depicted as the Dharmakaya of the Buddha. It represents the Buddha’s mind quality which brings peace, prosperity, good health and long life for all beings in all lifetimes. Particularly for those who are involved in this noble cause of building the Stupas, since the act is considered as one of the greatest work of merit. 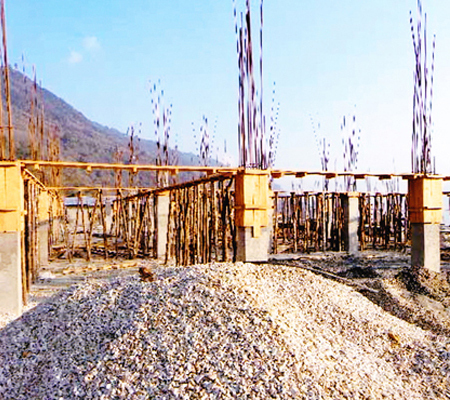 The Stupas are now under construction. Furthermore, the compassionate Khenpo Karpo Rinpoche is genuinely conscious about the decay of individual’s inner peace due to material developments. It is very vital for all walks of life to keep a balance in between the material and spirituality. In order to reach the balance, it is essential to preserve and promote the priceless teaching of the most compassionate teacher, Buddha Shakyamuni. For the benefit of all beings, the Ven. Khenpo Karpo Rinpoche decided to realise this construction serves as both a Monks’ Residence as well as a Buddhist University allowing 300 monks to learn Buddhist philosophy (Science of Mind) and to spread and exchange the wisdom of Buddha to all over the world after they received the full education from the monastery. The construction is currently in progress. 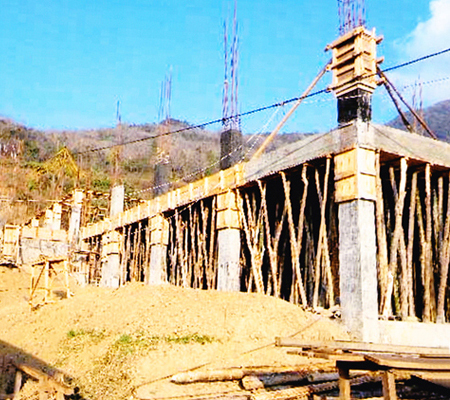 Please kindly help us to build the Monks’ Residence/University. Druk Odiyana Foundation is earnestly grateful for all your great supports for the time being. The following work is going to be even more laborious since a backlight of 190 feet in height and 118 feet in width with an umbrella at the top of Guru Statue is going to be built. (If a storey counts for 10 feet, the total height of this huge backlight is equivalent to a 19 storey building.) 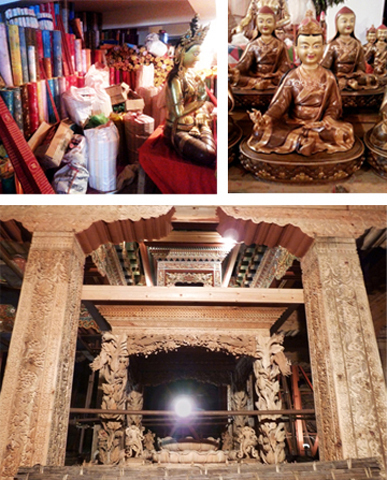 All the elements and ornaments will be men-made by Nepalese carving artists.